Now you can upgrade your manual sharpener to Automatic. Ask your dealer how. Dinasaw MSA Bandsaw Sharpeners allow you to improve your saw’s cutting efficiency by optimising tip angles. Better tooth penetration and chip removal means blades cut faster, more accurately and stay sharp longer. It’s all about the teeth – they do the work – improving the teeth’s geometry increases cutting speed and accuracy while decreasing frictional heat and sawdust packing. Normal sharpeners can only sharpen perpendicular to the blade – the patented Dinasaw MSA sharpeners can also sharpen with a positive 10degree angle across the set teeth’s tips to enhance cutting and sawdust extraction. 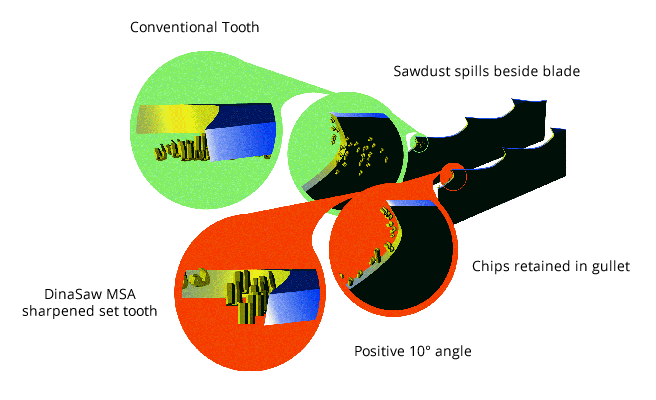 The saw’s set teeth do the majority of the work and angling their cutting face produces larger chips that are directed towards the centre so they are better retained in the gullet. Standard, straight sharpened teeth generate smaller chips that are forced directly down to spill beside the blade causing friction that heats and buckles the blade. 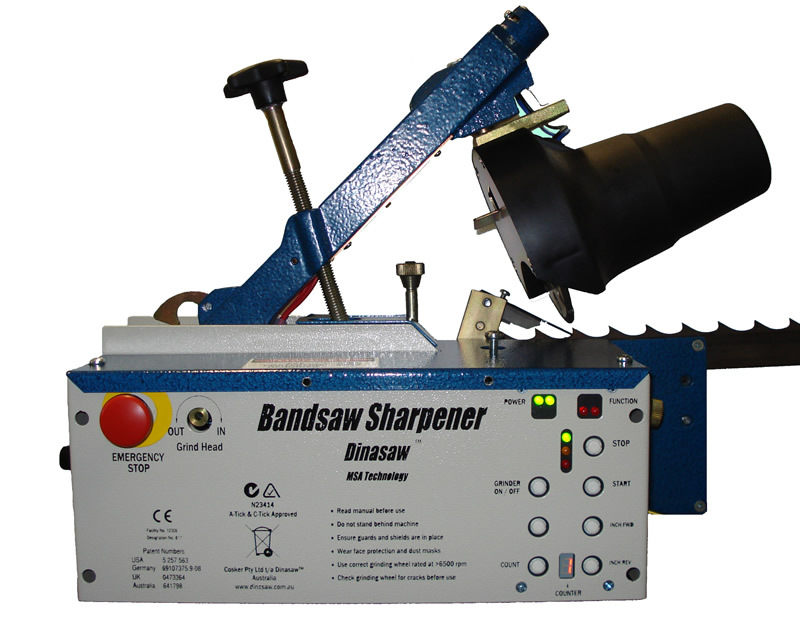 Dinasaw’s range of Bandsaw sharpeners are the most accurate, versatile and cost effective machines available. The Manual machine is operated by turning a handle. One turn of the handle will sharpen one tooth. The Fully Automatic machine is just that. Automatic. Controlled by state of the art electronics, this machine is able to monitor how many times the blade has gone around the machine and shut it off automatically at a predetermined point. Software driven softstart means the machine can be fitted with ABN or CBN grinding wheels without excess current draw.